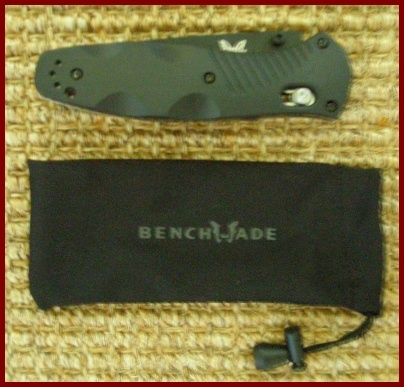 The Benchmade 580 BK Barrage arrived in mint condition with a user care manual (for maintenance). It was encased in a small silk-like sack. A consumer catalog with the entire line of knives was included. I looked over the knife carefully and my first thoughts were related to how do I open it? For backpacking, I currently use a fixed-blade knife as well as a small pocket knife that has a simple safety lock. The 580 BK Barrage looked a bit more complex compared to them. I found the sliding lock on the side of the knife but didn't realize at first that I was trying to open the knife with the lock in the closed position. I tried to pull the blade open manually and it wouldn't budge. I looked at the diagram on the website (and which I later found in the consumer catalog) but it still wasn't clear to me). Well after a few embarrassing moments I learned how to open the knife. I'm only pointing this out because not everyone has prior experience with the type of mechanism on this particular knife. After unlocking the knife, the blade will start to open with the thumb stud. The coil spring engages and it powerfully pops open (AXIS-ASSIST). It can be a bit intimidating at first. It can definitely be a one-handed operation and after a few times I was confident to open it with one hand. The knife has ambidextrous thumb-studs so it can be opened in either hand. The 580 BK Barrage Knife has an AXIS-ASSIST mechanism. This allows the knife to snap open for quick action. I'm still getting used to the power of the coil spring assist and have manually pulled the knife open as well (after unlocking it). What is neat about this knife is that it can be safely locked in the open position as well. According to Benchmade, the "AXIS gets its function from a small, hardened steel bar which rides forward and back in a slot machined into both steel liners. The bar extends to both sides of the knife, spanning the liners and positioned over the rear of the blade. It engages a ramped, tang portion of the knife blade when it is opened. Two omega style springs, one on each liner, give the locking bar it’s inertia to engage the knife tang, and as a result the tang is wedged solidly between a sizable stop pin and the AXIS bar itself". The 580 BK Barrage belongs to the "Blue Class" of knives by the manufacturer. As stated in their consumer catalog, "These USA made products are designed and built for the individual who appreciates the difference that a high-quality cutting tool can make." The 580 Barrage comes in a variety of styles. It can either possess a plain edge (580 or 580 BK) or a partially serrated edge (580S or 580SBK). The BK in the title of the knife I am testing refers to the black matte coating that according to the manufacturer has a higher scratch resistance and provides excellent corrosion protection. The knife also has a reversible carry-clip (about 2 in/5cm in length) on its handle. This can be unmounted and re-positioned on the other side if desired. The carry clip is reportedly called a "Reversible Bright Split Arrow Clip" design. Since I normally carry my fixed blade in a sheath and my small knife on a lanyard, I will try using the clip to see if it works with my style. However sheaths are available for purchase for this style. The drop point blade is made out of 154CM Stainless Steel which is considered a premium stainless steel. It reportedly is corrosion resistant, has excellent toughness and edge quality. The black coated blade of the knife has the designers name "Osborne", the Benchmade symbol with the butterfly, and the grade of steel is also imprinted. The liners of the knife are made out of 420J Stainless Steel for corrosion resistance. The Valox handle of the 580 BK Barrage is molded out of reinforced resin that reportedly has excellent stiffness, strength and dimensional stability. The handle has eleven parallel ridges for grip on each side of the handle. On the lower half of the knife there are four grooves on each side. There is also a lanyard hole near the bottom edge of the knife. The workmanship on the Benchmade 580 BK Barrage Knife is no less than excellent. There is an extensive description with the warranty for the knife. Using the knife as only a cutting tool and not for other purposes was recommended. I look forward to using the knife during the next four months of backpacking. I already took it out on a short backpacking trip but I will report on that in the field report due in two months. During the field test period, I have carried or used the Benchmade 580 Barrage Knife during five backpacking excursions for a total of fifteen trail days. The knife was also used for everyday needs. Locations ranged from and included boreal and deciduous forest communities, backcountry lakes, islands and more. Elevation ranged from 600 ft (183 m) to approximately 1400 ft (427 m). Sky and Air Conditions: Sunny! During the field test period the Benchmade Barrage 580 Knife has been dependable for a variety of uses. Since I foremost carry a knife for survival-type purposes I have mostly used the knife for daily activities to make sure that I can dependably and safely open, close and use it if I were in dire straights. The AXIS-ASSIST feature of the knife was a bit frightening at first as I was overly cautious when opening it. The quick action surprised me initially and my friends look at me a little differently (they don't have knives that pop open like that)! Although I can easily open it with my right hand, opening it with my left hand is awkward (this is to be expected as I am not ambidextrous). The clip on the handle feels almost in the way when I am grasping the knife. I guess in the long run I would prefer not to have the clip on the knife but I won't remove it until the test is over. I have used the knife for the normal preparation of foods including vegetables, fruits, cheese and meat. I have also used it to cut 5 mm (0.20 in) cordage and open packages secured with heavy bands, packing tape and such. 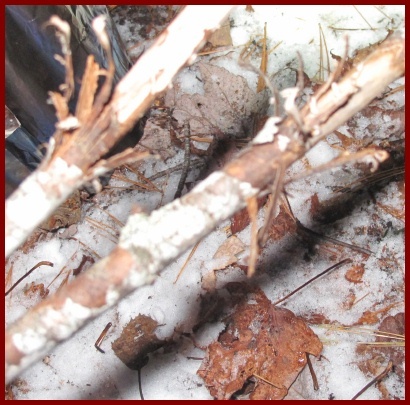 It was used to trim back some small dead branches off a pine tree (near my tarp) on one of my trips. I wish I could say that I have done a zillion exotic things with this knife but all my activity has been normal. I find that the blade of the knife is a bit thick for cutting veggies such as parsnips, rutabagas, squash, etc, but it is doable. It is definitely sharp enough, it's just that it gets bogged down in fibrous vegetables. I wouldn't ordinarily use this type of knife for that purpose but I'm using the knife on whatever I need to cut. The size and weight of this knife fits right in between other knives that I own. I normally use a small folding knife for most outings and carry a large fixed blade for solo trips. I was hoping that the Barrage 580 would take the place of my large knife but it I were to use it like the fixed blade the warranty would be compromised. I do have to remind myself that this knife shouldn't be used as a wedge to split wood like I do with the fixed blade. I do love the double lock system on the knife. It makes me feel safer knowing that the knife won't just pop open if something presses against it accidentally. I use the locking bar all the time when the knife is being carried. I have tried various methods of carrying the knife. I tied a lanyard to the knife with thin cordage and fastened the other end of the lanyard to a waistband loop on my pants. That way I could pull the knife in and out of the pocket and not fear losing it. 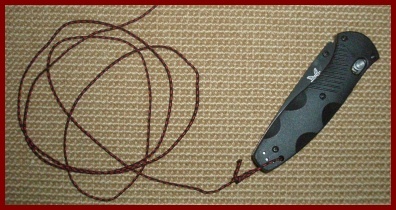 I soon discovered that this wasn't the best arrangement as the cordage some times got in the way of closing the knife. I also preferred not to have the weighty knife (4.3 oz/122 g) resting in the bottom of my pocket. The clip option is not my preference as far as clipping it to my clothing but it works well on my pack. However, most of the time I just store the Barrage 580 in the top pocket of my pack as it is convenient enough if I need the knife for a chore. So far the durability of the knife is not in question. The knife has held an edge well and is still very sharp. It has been wet a lot both in the field and at home and there is no sign of rust or deformity. I don't always wipe it dry immediately. In the long term period I will concentrate on making some fuzz sticks and such with the knife. With less daylight hours this will be a good activity for long evenings at camp. During the long term test period, I have carried or used the Benchmade 580 Barrage Knife during two backcountry excursions for a total of six additional field days. The knife was also used for daily needs at home. 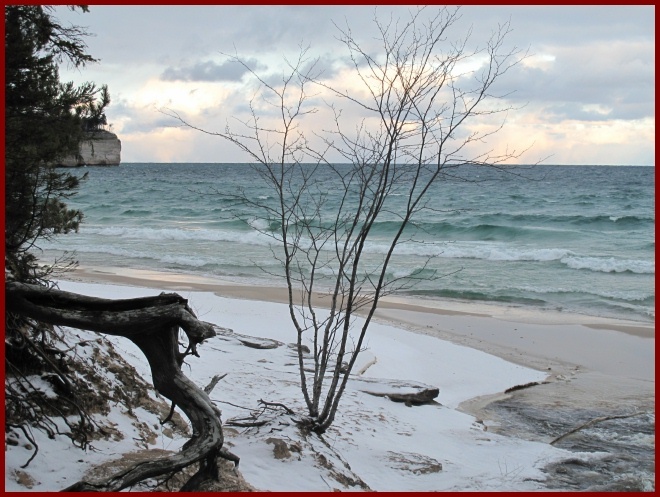 Locations ranged from and included boreal and deciduous forest communities, lakeshore, and more. Elevation ranged from 600 ft (183 m) to approximately 1400 ft (427 m). During the long term test period, the Benchmade Barrage 580 Knife has continued to be a dependable and sturdy knife. During my early December backpacking trip, I decided to collect some downed hardwood branches to practice making fuzz sticks. This is not the most ideal type of wood for such sticks but it was a fun activity during an otherwise quiet and dark evening. After donning my headlamp for better vision I simply used the knife to see if I could peel long curls of bark back on the sticks for fire starting purposes. I was just practicing this as no fires were allowed at my backcountry site. The Barrage 580 was comfortable to use for such tasks and the sharp edge allowed me to peel the very thin bark back on the sticks. During my hike-in rustic cabin trip, I carried the knife at all times for safety purposes. This included daily excursions from the cabin while backcountry skiing and snowshoeing. I also used it to cut my steak for New Year's Eve dinner, to prepare vegetables for wood stove cooking and to cut slivers of wood from large pieces of wood so that I would have shavings to start the fire each morning (I let it go out each night as the cabin gets too hot). In addition, during the holiday season the knife has been handy to open a variety of cardboard containers that have arrived at my house. The knife is very sharp but I find I can easily control it so as to not puncture the contents. I have also continued to use it for cutting vegetables, fruit and meat at home. The Barrage 580 becomes easier to use all the time. It may just be that I am more comfortable with it than after I first received it. I continue to favor the double-lock system on the knife. It gives me a secure feeling that it won't accidentally open and that when the lock is latched that it will stay open. The handle of the knife continues to give me an excellent grip even though my hands have been wet at times as well as while wearing thin gloves (with gripper dots). The Barrage 580 is no doubt a very sturdy and durable knife. The AXIS-ASSIST feature remains working perfectly with no side play and the knife still holds a good edge even though I have used it for a variety of tasks. I have not sharpened the knife as I haven't felt the need to do so. The black matte coating on the knife has held up equally well and there are no signs of corrosion anywhere. In conclusion, the Barrage 580 BK has been a neat addition to my backpacking gear. It has performed well for a variety of tasks and I have come to depend on it. I especially like the double-lock feature for safety purposes but find the knife a bit heavy for most backpacking trips. This is one fine knife! I will continue to carry the Barrage for my solo trips but I likely will carry a smaller knife during group trips (as others always carry bigger knives for other purposes if needed). I will likely remove the attached clip as I prefer not to use that feature as carrying it in my backpack works much better for me. Thanks to Benchmade and BackpackGearTest for this interesting opportunity to test the Barrage 580 BK Knife. This concludes my Long Term Report and the test series.